Explanation: Where do stars form? Many times, stars form in energetic regions where gas and dark dust are pushed around in chaotic mayhem. Pictured, bright massive stars near the center of W5, the Soul Nebula, are exploding and emitting ionizing light and energetic winds. The outward-moving light and gas push away and evaporate much surrounding gas and dust, but leave pillars of gas behind dense protective knots. Inside these knots, though, stars also form. The featured image highlights the inner sanctum of W5, an arena spanning about 1,000 light years that is rich in star forming pillars. 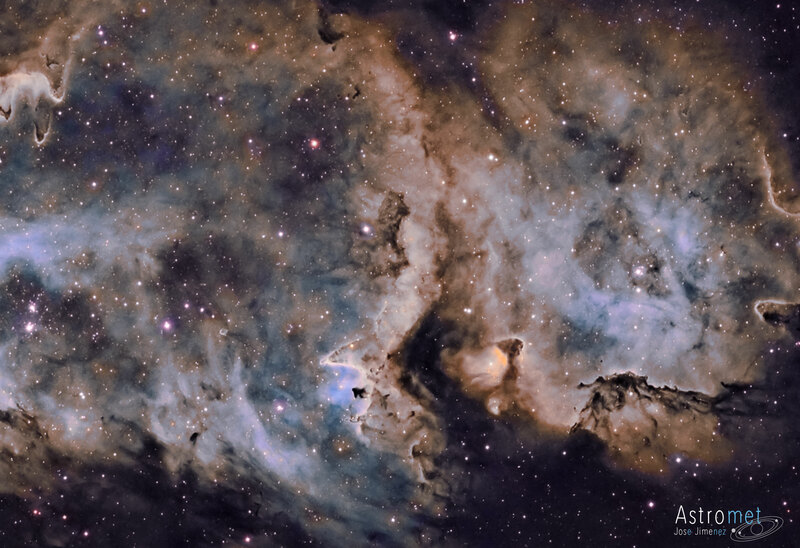 The Soul Nebula, also cataloged as IC 1848, lies about 6,500 light years away toward the constellation of the Queen of Aethopia (Cassiopeia). Likely, in few hundred million years, only a cluster of the resulting stars will remain. Then, these stars will drift apart.